Big Tree Comics was founded in 2014 by Kyrun Silva. Since then, he has built up a creative team who work on Big Tree titles, and outside commissions. Their first comic was the six-issue miniseries Shaman’s Destiny. Since then, they have added three other titles to their roster. They attend many conventions and store signings, and are involved in both the Superhero Thrill Fun Run and the Free Comic Book Day Festival. Kyrun tells us more about Big Tree Comics. IM: What is Shaman’s Destiny about? 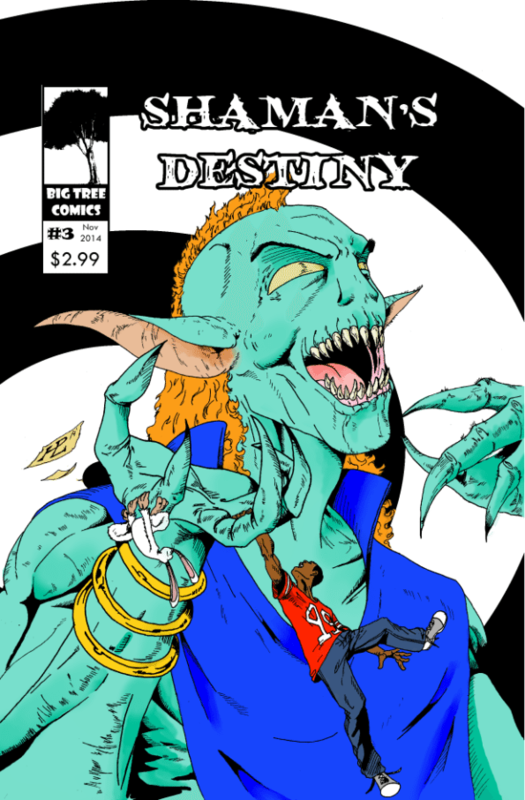 KS: Shaman’s Destiny was the first book published by Big Tree Comics. I created the series, wrote and drew it. It’s a story about Malik, who is a newly-appointed shaman. He’s been appointed by the spirit of the earth Gaea to protect our world from demons, creatures, and other beings. 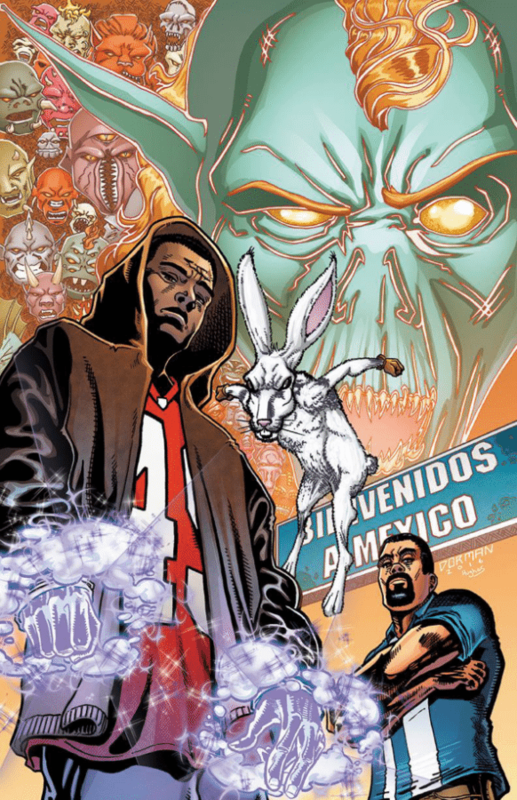 He notices that his powers aren’t working the way they normally do, so he sets off with his guardian, Jeph, who is a talking rabbit, to determine why his powers are failing him. Along the way, he meets up with other powered individuals and beings. Some are out to hurt him, while others try to help. IM: What is Whyte & Wong about? KS: Ricky Eaddy created, wrote, and drew Whyte & Wong. It’s a buddy cop comedy series. Carter Whyte is the grizzled veteran and Trevor Wong is the slacker rookie. They both work as detectives in the police force of San Francisco. They’ve been paired and now have to learn how to work together. Their first case is to find out who the mysterious figure is that controls the organized crime in the city, a figure known only as The Rooster. IM: What is Joshuan Somewhere about? KS: This is created and written by Dennis Nancarrow and drawn by Larry Haines. It’s a coming of age series about Joshuan Somewhere. Joshuan is a loner in school, who gets transported to different planets by his bracelet called A.S.P.E.N. The bracelet takes him on his journey as he learns how to be hero. Joshuan learns that the bracelet was designed by his father, who he thought was gone, and he has to figure out what plans his father has for him and the bracelet. IM: Big Tree Comics also has a web-only comic: Vocabularious. What is it about? KS: Vocabularious is written and drawn by Ricky also. It’s on hiatus right now as he focuses on Whyte & Wong, but what he does is take an obscure word and turn it into a one panel strip describing something that’s happened in his life. It stars Ricky and his lovely family. We decided to make this a free web comic, so people can enjoy Ricky’s humor. IM: How do you find: Smack Jeeves as a publisher? KS: I found Smack Jeeves through another artist, Melissa McCommon. She runs an amazing web comic called Epic Chaos, and has used Smack Jeeves for years. It’s a great way to get your work out to a mass audience really quickly. They provide great tools to help design and publish a web comic site very easily. 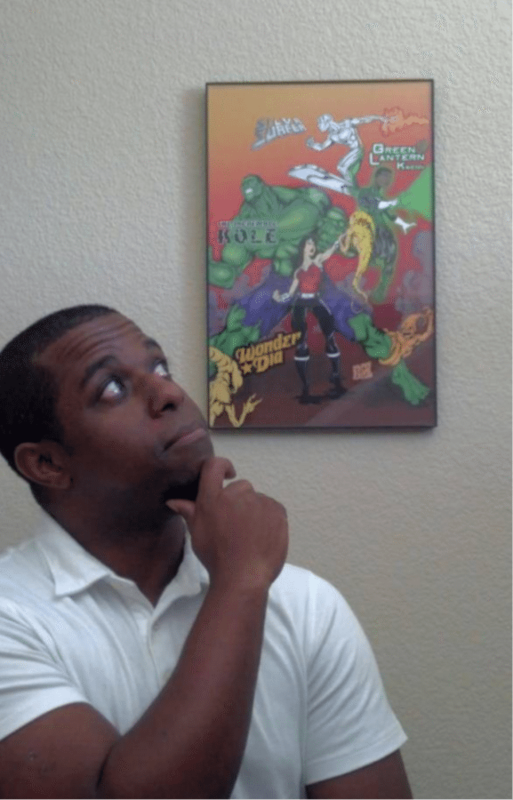 IM: What made you decide to start your own comic book company? KS: I decided to start my own company, because I wanted to tell stories that I thought were interesting and enjoyable. It’s sort of selfish, but I wanted to make comics for myself. Once I started doing it, I realized that I knew so many talented people, and I wanted them to find a way to develop their books also. IM: Did you start it and then get the other creators involved, or was everyone there from the start? KS: I started everything back in 2014. About a year later, I brought Ricky along, first doing the web comic, and then Whyte & Wong. By the end of 2015, I had started the ball rolling on getting Joshuan Somewhere produced. IM: Are the comics creator- or company-owned? KS: The comics are all creator-owned. KS: Funny thing is, I have no background in art or graphic work. I went to school for accounting, but I realized very quickly that it wasn’t for me. I’ve always enjoyed drawing and creating since I was a little kid. After enough coaxing from my wife, I decided one day to just sit down and start my own comic book. IM: How do you promote your work? KS: Mostly through social media and word of mouth. I have a great group of friends and family that are always there and willing to help me promote anything new that we are doing. IM: Do you do a lot of appearances at conventions and stores? KS: We usually do one to two appearances each month. We are always willing to do more if someone wants to invite us somewhere. IM: How important are they for getting your work known, and sold? KS: Doing shows and store events are essential to getting our work sold. We are at a time where there are literally thousands of people self-publishing their comics, either in print or on the web. Getting face to face with a potential client gives me an opportunity to put my books in a reader’s hand and have a better chance of them choosing us over someone else’s book. IM: What advice would you give to someone about them? KS: Don’t be discouraged if you don’t sell a lot of products, especially at your first few shows. It takes time before you can do this and make money. Try to have fun at any event you do. If you have a nice time and people can see that, they are more likely to stop and look at your stuff. IM: Can you tell us more about your third-r year “Launch Party”? KS: In May was Free Comic Book day and we released three different books that day (Shaman’s Destiny #5, Whyte & Wong #2 and Joshuan Somewhere #1). We showcased our books at three different stores here in Sacramento, but we found that because of the crowds, we didn’t get a lot of time to talk with customers. IM: You have your own online shop Bigtreecomics.storenvy.com and a print-on-demand shop on IndyPlanet. Which do you find works best? KS: The print-on-demand still is our bestseller. Even though technology lets someone have hundreds of comics on their iPad, I still find most people enjoy having an actual comic book in their hands to read. IM: Are you on Comixology? KS: We are on Comixology, but only Shaman’s Destiny #1 is listed at this time. 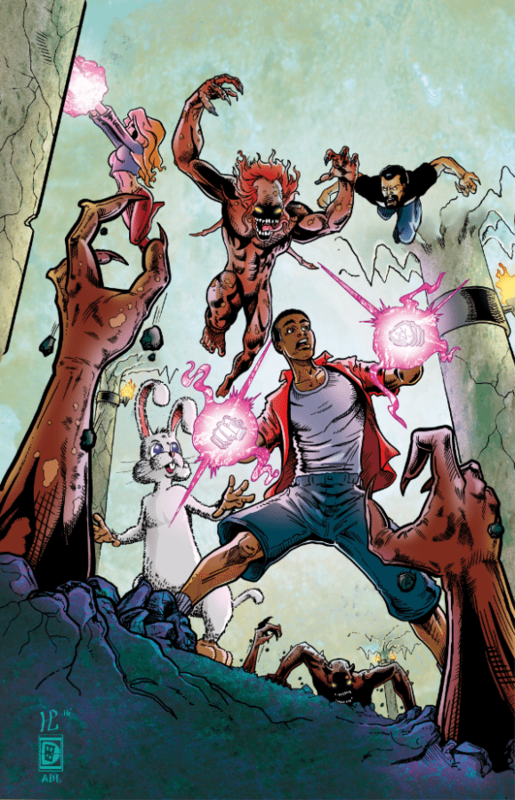 Within the next few months, though, we should have our other series on Comixology and other digital outlets. IM: You also use DriveThruComics. Do you think digital comics make it easier for indy publishers to sell to a worldwide audience? KS: Digital comics are a great way to get your book to a broader audience. We’ve definitely received interest from different parts of the world using DriveThru and Amazon. IM: How important is it to you to get your works into bricks-and-mortar comic shops as well as online ones? KS: Our first goal is always to get into local comic shops. Comic shops are the backbone of the comic industry. Most comic shops are great at recommending indy series to customers. IM: Is it difficult to juggle creating commissions (other comics and art for BTC’s shop) and your own comic creations? KS: Commissions are always stressful for me. Doing someone else’s characters can be very nerve-wracking. IM: You’re participating in the Superhero Thrill 3 and 5k Fun Run/Walk; could you tell us more about it? KS: The Superhero Thrill run was created to support the Hmongstory 40 exhibit coming to Sacramento, CA. People dress up as superheroes and run through an obstacle course and mini marathon. It’s all for fun and charity, and a great family event. We were lucky to be invited. IM: You are also involved with the Free Comic Book Day Festival 2016. Is it a big event in your local area? KS: Free Comic Book Day has slowly evolved into a huge event. It’s basically a miniature comic convention in most places. Where I live, a lot of stores allow local creators to come down and showcase their creations for everyone to see. IM: I’ve seen Empire Comics Vault mentioned a few times in stuff related to Big Tree Comics. Is there a connection between the companies, or is it just a friend/fan/helpful local shop? KS: Empire Comics Vault has been a huge help in the process of Big Tree Comics getting off the ground. It was the first store to allow me to display my books, and also the first store to sell our books. Because of their continuous support, we are always working with them. IM: You have some merchandising (mouse mats). Is that something you want to expand in the future? KS: We are slowly making our way into merchandising. We are planning on testing things to see what might interest people. I’m really excited about the idea of Big Tree Comics cookies that we hope to launch soon, but that won’t be for a while. Slowly, we will start rolling out different products for people to get from us. KS: I would like to thank all our fans who have supported us over the last couple of years. Please keep sharing our work. Without your support, we could not be here. I also want to thank the great staff at Indyfest for taking the time to interview us. We have some amazing things coming out in the future that we can’t wait to share them with you.